With the way life has been lately, it’s the only way to go. I’m not complaining — in fact, I’ve learned more about myself, about others, about life in general these past couple of months than I have in a long time, and I am grateful. It’s another step in the process of growing up, I guess (“If only someone had told us when we were in high school how tough it is to be an adult!” my friends and I say. Ah, hindsight is 20/20). So, instead of crawling back into a cave, where everything seems comfortable and easy and unobtrusive (and yet, ignorant and stagnant), I’m pressing forward. And I’m taking this stromboli with me. The first time I made stromboli, I was worried. I was worried it would taste boring, with too much crust and not enough filling, or that all of the filling would spill out of the bottom leaving me with a pizza crust skeleton and a lovely mess of cheese on the side. That is my way, worrying. But I forged ahead anyway, as is also my way these days. 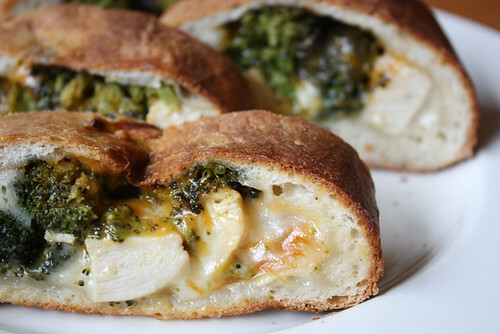 And I’m glad I did, because on the other end of the bridge was me and this glorious goodness — this ooey-gooey, cheesy and crusty wonder — stuffed with pieces of tender, juicy chicken and crisp, roasted broccoli. One bite, and my worries were gone. 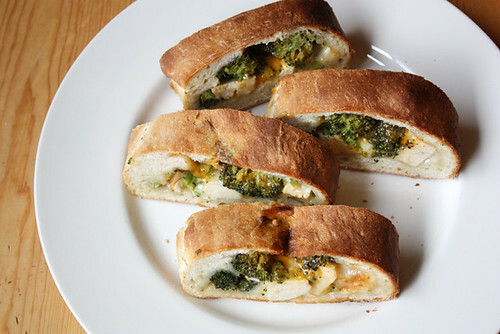 Of course, a stromboli won’t take all of your cares away. It won’t make the rain turn into rainbows, and it won’t turn a bad egg into a golden one. In the end, it’s just a stromboli. But sometimes, that’s all we need, isn’t it? Just a little something, something to remind us of the small joys in life, something that shows us, in the deepest, darkest of caves, that there is goodness on the other side. And I’m going there, headfirst, belly full. P.S. Check out this equally yummy Mushroom Fontina Stromboli over at Tablespoon. On a pizza stone or parchment paper-lined baking sheet, press dough into a 14-by-10-inch rectangle. Sprinkle 1/2 cup mozzarella cheese on middle length of the dough. Top evenly with broccoli, then chicken. Top with cheddar cheese. Fold in short sides of dough by 1 inch, then fold in long sides over each other, overlapping in the center. Pinch to seal. Carefully flip dough over so the seal is on the bottom (if you’re nervous about this step, skip it: The stromboli just looks prettier with the seal on the bottom, but it’s not necessary). Bake stromboli for about 20 minutes, or until crust is a deep golden brown. Let cool 10 minutes before slicing or serving. Oh my gosh! I haven’t had stromboli in years…not since those highschool days when I was totally ignorant of how good I had it (sigh). I think I might have to make this. Looks so cheesy, crusty, cozy…perfect for fall! I love broccoli! This looks and sounds scrumptious, can’t wait to try it! I’m totally drooling. 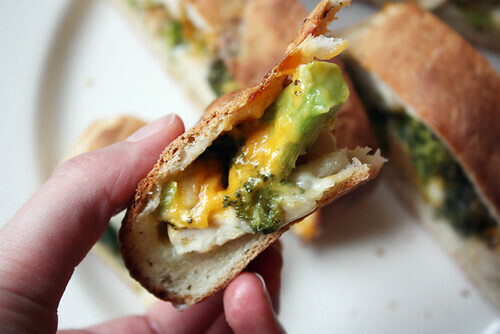 Cheese, broccoli, and chicken – what’s not to love? Your outlook on life is a great one – keep your head up on those rainy days! This is undoubtedly not the right thing to eat after following my high blood pressure scare last weekend, but I suspect the rest of my family will enjoy it! Is there a way though to get lower-fat cheese maybe so I can have some too? I plan to make a few of these this week and freeze them uncooked!! Then I’ll thaw them n cook them. Great freezer meals!! Zelda — Sounds like a great plan!